Back on Television My television and I are very happy this week. 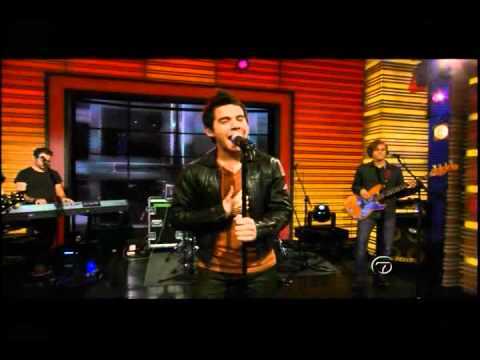 David Archuleta has made several TV appearances to promote his album, The Other Side of Down. On the Regis & Kelly show he explained that the inspiration for his latest single, “Elevator,” was a dream he had about riding an elevator, unsure which floor to choose. Regis Philbin wisely advised David always to get off on the ‘top floor’. David Archuleta goes to the top! On his new album David sings about the ‘other side of down,’ which is ‘up,’ and inspires everyone to be positive. On Regis & Kelly he sang two songs, “Elevator” and “Falling Stars,” accompanied on guitar by bandmate and co-writer Mike Krompass and other musicians. And by the way, David looks great in the leather jacket and those autumnal colors. Did you miss the “Little Ole Lady” photo last week?